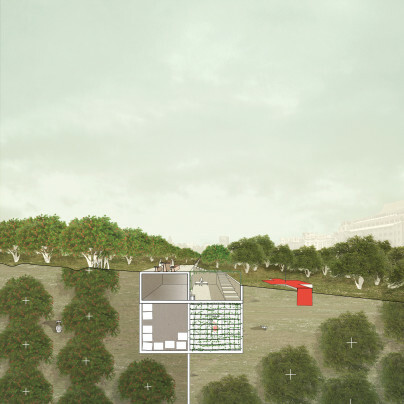 This project explores theories about framing a landscape in the area around the Palace of the Parliament in Bucharest. A major urban renewal project begun in 1986 was left incomplete by the revolution of three years later. The result is a not quite finished, disproportionately large palace in the midst of the ancient urban fabric, city blocks from the end of the Communist period and neglected and overrun plots. Orchard A production landscape for public use, the trees can be rented by city dwellers. The cultivation of indigenous fruit varieties harks back to an age when every house had its own orchard. The problems on site are partly to blame on the palace’s vast scale. 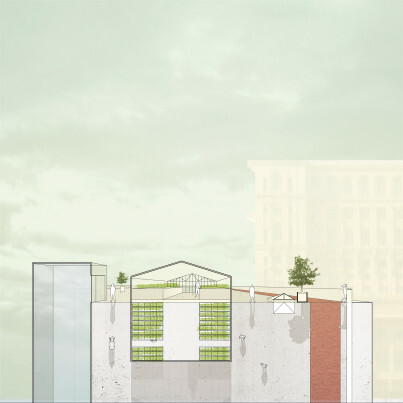 The concept of the frame provides a workable platform from which to critically review the relationship between the site and the city as well as the way a landscape architecture project can frame the continuity of the urban landscape across all scales. In this project, I accept the frame for what it is and instead focus on what it does. It causes a division, creating a situation of inclusion and exclusion. In Bucharest, the analysis points out the importance of the topography of the bed of the Dâmbovița River, which plays a key role in structuring the area. My strategy is targeted at using the mechanisms of framing to develop with great precision and intensity a central urban landscape. This enables a wide variety of parks to gel in a totality that transcends the initial frames. Unfolded series of frame-of-frames as part of the expansive park atop the hills of Bucharest. Amphitheatre and facilities grid. The infrastructure consists of water supply, electricity and light in a grid of 60 x 60 m. The intersections are fitted out with multi-purpose furniture. The design strategy consists of a series of interventions selected on the basis of their capacity to reframe and renew the existing frames of the site. The design itself takes the form of a number of components, or frames, at different scales. Firstly, the site is reframed by four gardens which, stepping off from the existing geomorphology, are ranged along the curves of the ridge of hills. The gardens are stitched together by a slow traffic route, while a grid of facilities is the infrastructure for extending the strip of parkland and for informal functions. A wooded area the width of the palace neutralizes the latter’s dominant presence and together with new components brings unity to the site. The strategy makes use of frames-in-frames to re-articulate the site and develop it far beyond its own frames in a series of parks spanning many scales and extending across the landscape of Bucharest. Working in a landscape architecture office in London. 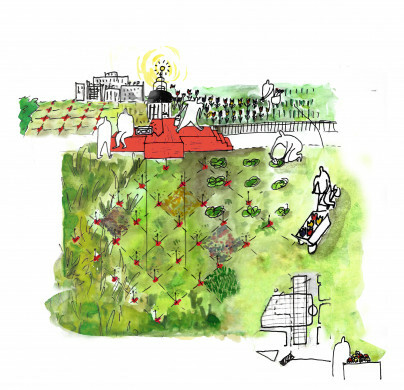 Continuing landscape and urban related research projects concerning Bucharest. Thinking about the temporal and rhythmic aspects of the framing of landscape. Working on mapping and illustration projects.